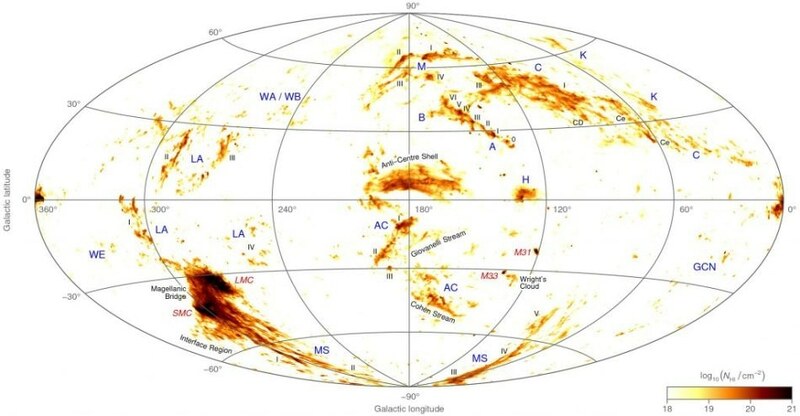 An all-sky map showing the location and column density of neutral hydrogen gas belonging to the high-velocity clouds of the Milky Way and two neighbouring galaxies, the Large and Small Magellanic Clouds. Credit: ICRAR. It was created by astronomer Dr Tobias Westmeier, from The University of Western Australia node of the International Centre for Radio Astronomy Research, and published today in the leading journal Monthly Notices of the Royal Astronomical Society. Dr Westmeier said the map suggests that at least 13 per cent of the sky is covered by high-velocity clouds. The map was compiled by taking a picture of the sky and masking out gas that is moving at the same pace as the Milky Way to show the location of gas travelling at a different speed. The research used data from the HI4PI survey, a study of the entire sky released late last year. The survey combines observations from CSIRO’s Parkes Observatory in Australia and the Effelsberg 100m Radio Telescope operated by the Max-Planck Institute for Radio Astronomy in Germany. Dr Westmeier said astronomers had proposed several hypotheses about where high-velocity clouds come from. Until about a decade ago, even the distances to high-velocity clouds had been a mystery, Dr Westmeier said. “We now know that the clouds are very close to the Milky Way, within about 30,000 light years of the disc,” he said. The map will be freely available to astronomers around the world, helping them to learn more about high-velocity clouds and the local Universe.